Payments are generally made to the supplier providing the goods or services, however sometimes there is requirement when supplier ask you to made payments to different party on supplier’s behalf. All the payments made to other parties on behalf of the supplier is termed as Third Party Payments. Let’s take an example, in ordinary case, Supplier ‘A’ supplied the goods to customer ‘B’ and invoiced ‘B’ , and customer ‘B’ then made payments to A. Supplier ‘A’ sends the invoice to Customer ‘B’ for the goods provided. Now there is an agreement between ‘A’ & ‘C’ and ‘A’ informs ‘B’ to make the invoice payment to ‘C’ instead of ‘A’. In such case court or the collection agency sends notification to all customers of this supplier saying that any outstanding payments that are due to this supplier should be paid to them instead to the supplier. Supplier having a cash flow problem. Here, the supplier has sold all the receivables to a party. The party then notifies this supplier’s customers about this change and any outstanding payments should now be paid to them and not to the supplier. 1. Ensure the Third Supplier is created as a supplier in the application. Payables Options have been modified to provide an option that will help define the behavior of “Remit To Supplier Name” & “Remit To Supplier Site” fields on Invoices and Payment screens. 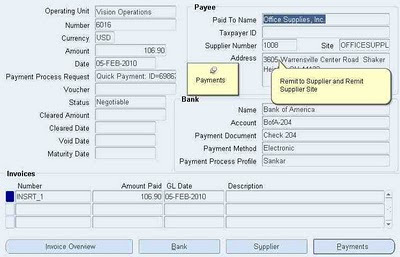 A checkbox named “Allow Remit To Supplier Override” is provided. This setup at Invoices tab has impact on Invoice Workbench, Quick Invoices and Recurring Invoices screens. When this checkbox is selected, then the “Remit To Supplier Name” & “Remit To Supplier Site” fields will be editable and it will enable the users to override the defaulted information and when this check box is unselected these fields will be non-editable. Please note: “Allow Remit To Supplier Override” feature is available only on Payment Workbench. It is not available during Payment Process Request flow. In the Open Interface Invoices header optional fields are available to record the third party details like “Remit To Supplier Name”, “Remit To Supplier Number” etc. The same fields have been added in the interface tables.During the invoices import, the program will validate the data provided for third party related fields with that of the existing relationship. If an invalid and inconsistent data is found, such invoices will be rejected. The program log will display the reject codes and related explanation. Once Setup is complete, next step is to create invoice for the invoicing supplier. Here the third party details will be defaulted on the invoice as per the Relationship established at the Invoicing Supplier setup. As shown Below , as per our setup in above steps , when we create invoices “Remit To Supplier Name”, “Remit To Supplier Number” will defaulted . On the Payment Workbench header, TWO fields named - “Remit To Supplier Name” & “Remit To Supplier Site” have been added. The behavior and information defaulting for the third party supplier related fields (including the payment method and remit to account LOVs) will be similar to that we have seen earlier. However please note the information will be defaulted based on the payment date entered. IMPORTANT -Please Note that invoices will be selected based on the invoicing supplier information but the payment will be processed in favor of the third party supplier selected on the Payment Workbench header. Invoice has been created for ‘Dell ’ and ‘HP’ as the third party supplier. While processing payment, if the user has selected ‘Sony ’ and its site on the payment workbench header. Then the payments will be released in favor of ‘Sony’ even though the selected invoice has different third party supplier information. The point to remember here is that, the payments clerk has the over-riding authority while processing payments. But in case at the SETUP you have not mark the “Allow Remit to Supplier OverRide” , the Payment Clerk will not able to override and Payment will be processed to Supplier “HP” Only. 1.Can payment batches be processed for the remit to suppliers . 2.If the invoices are being bought through ap invoice interface, will the relationship still need to be setup even if we bring in the remit to supplier and supplier site data on the interface. Answer - Yes , for Third Party , we have to define the relationship in supplier setup. By just populating into the Interface table with "remit to " values will not work. 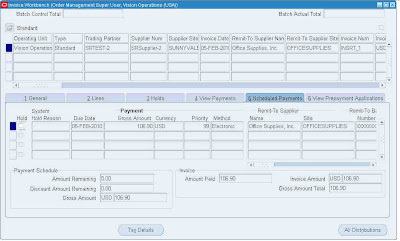 Scenario : Invoice has been created for ‘Dell ’ and ‘HP’ as the third party supplier. I have made a Third Party Payment as per your setups above. But when concurrent 'Payment Register report' is run the it shows the Supplier details of 'Dell' for that payment instead of 'HP'. Is it a bug or an Intended behavior , if yes can you clarify? I am having the same issue as Thejas has. Any update? We want to enable some suppliers with the third party payment facilities. But it is unable to find the Relationship tab in the create supplier screen. to find the Relationship tab in the create supplier screen.